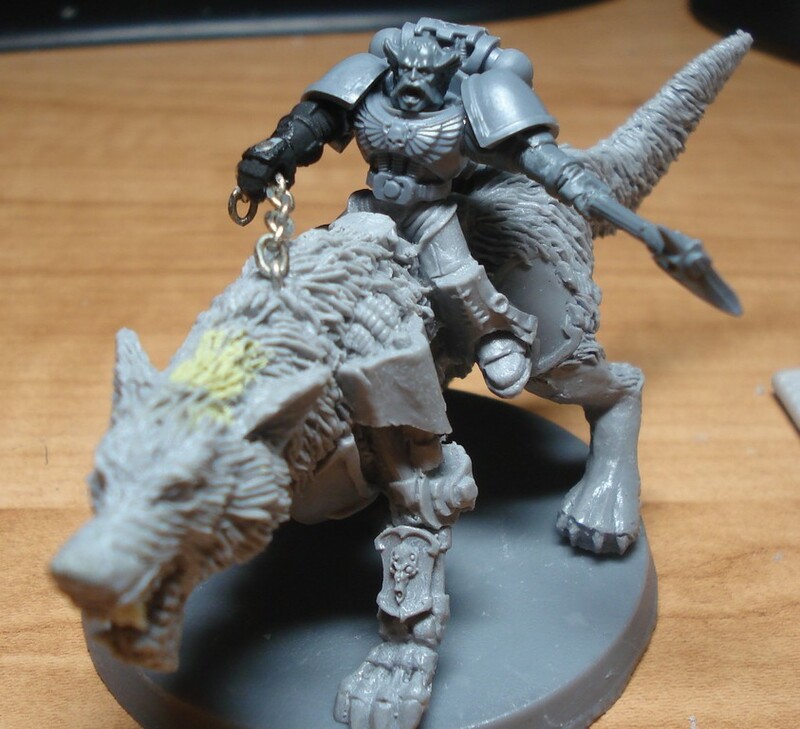 I worked on putting together the last 4 Thunderwolves I had last night. I really like the way they turned out. 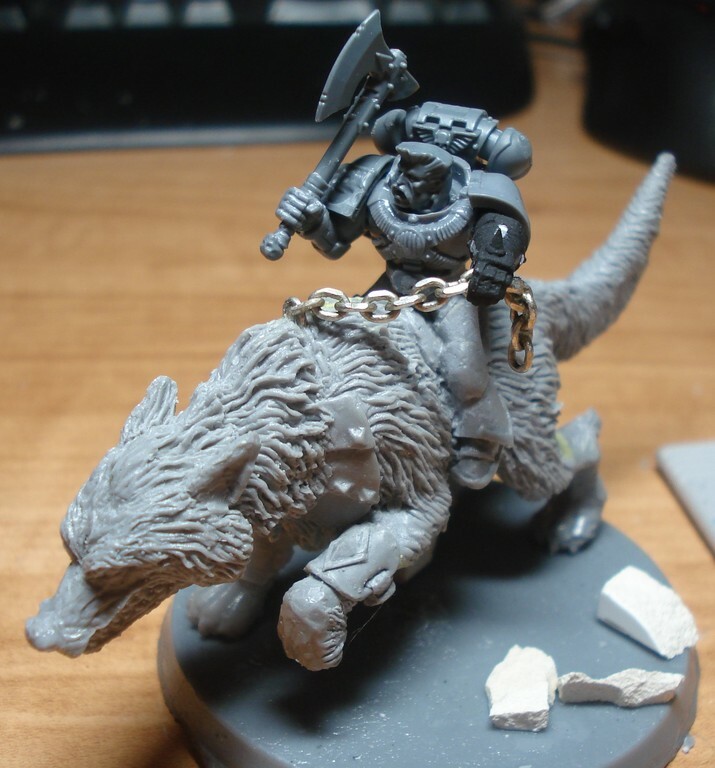 I was able to get some small chain from a necklace that my wife didn’t want anymore, so the riders are using that connected to the wolf’s harness. The arms holding the chain are from some old Chaos Bikers that I had lying around, and the axes are a mix of Chaos Marauders and Marauders horsemen. 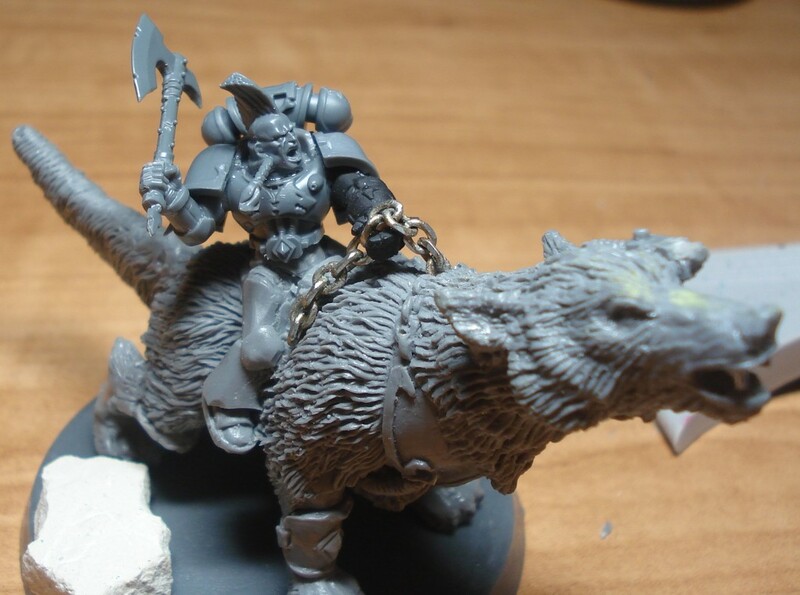 The axes were cut from the Marauders arms and then attached to Space Wolf arms with a pin and some glue. As always, click the picture to embiggen. I have a pair of Assault on Black Reach Dreadnoughts that I’d like to use, and I want to turn them into Riflemen (dual-autocannons). 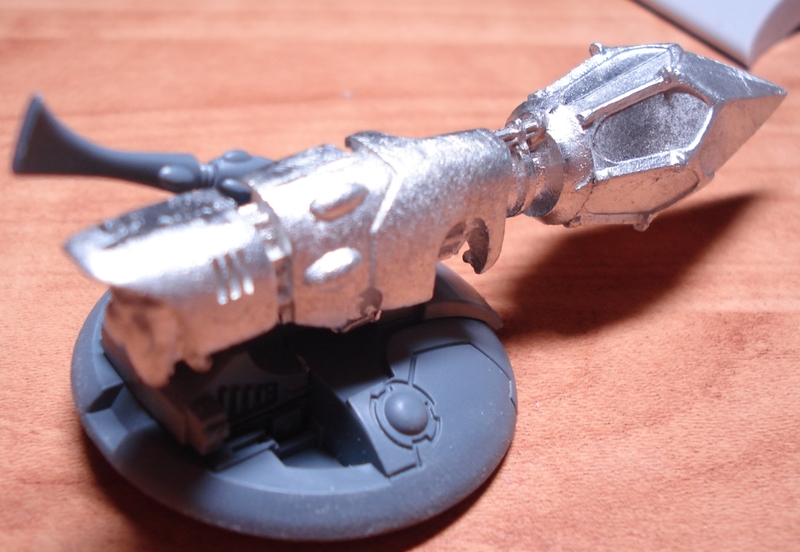 One idea I’ve had is to use a couple of the Burst Cannons from my Tau Hammerhead kits, since I’m not using them on the Tau. Here is a picture of a couple test poses. I kind of like the bottom one, but it does look a bit silly. 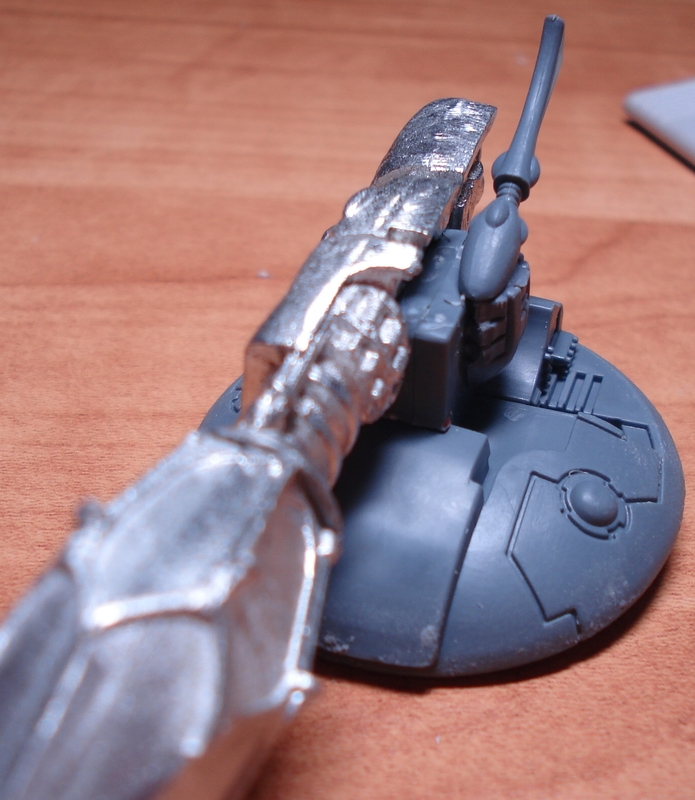 The top setup looks a bit more standard, but I’m not sure that I like the piece that is between the guns and the Dread (it’s part of the Skyray sprue). 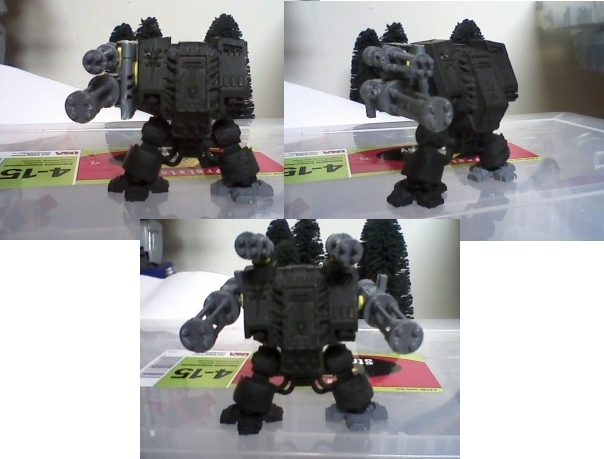 I would like to have it magnetized so I could use other arms in the future. 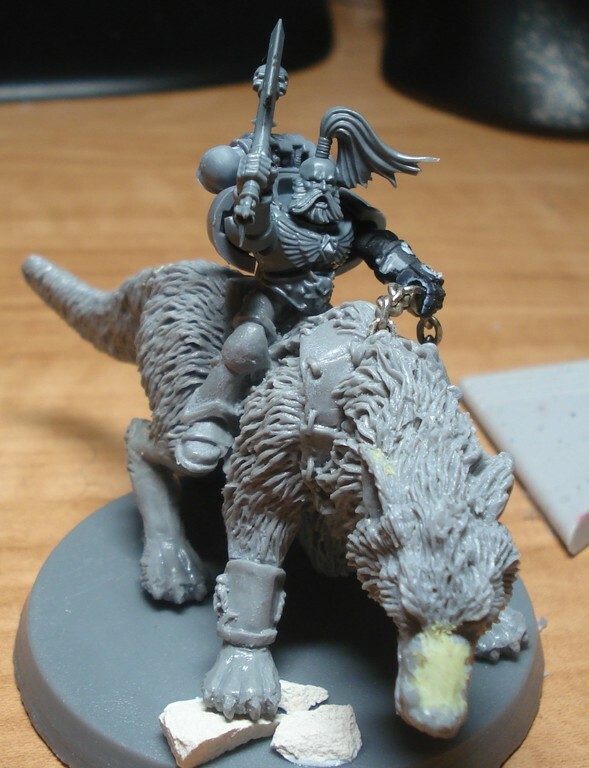 Here are my new Wolf Lords for my Space Wolf army. 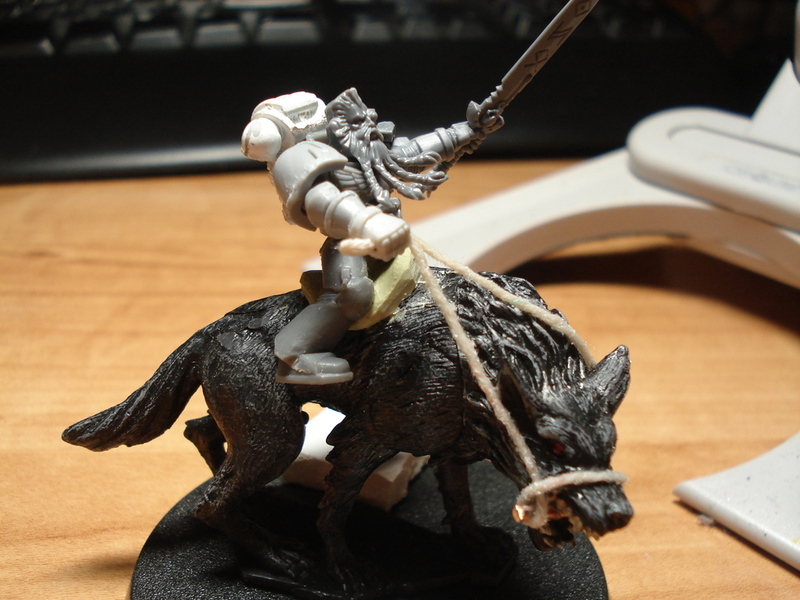 The first is riding a Vampire Dire wolf from the Dungeons and Dragons minis line, and wielding a Frost Blade. 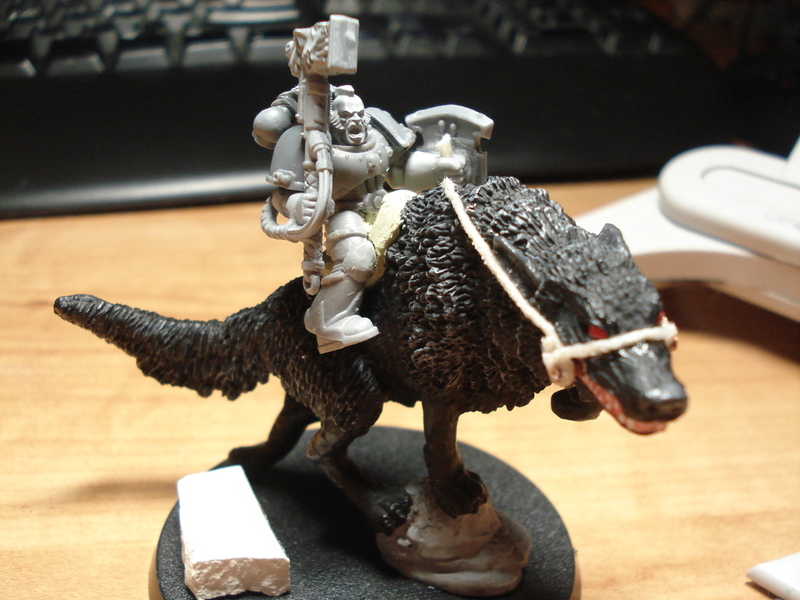 The second, armed with a Thunderhammer and a Storm Shield, is riding a Fenris Wolf from the Heroclix line. Putting these to together was a lot of fun, and I’m looking forward to painting them. One thing I realized while doing this is that I have a lot to learn about using green stuff. I tried making a saddle, but my skills are pretty limited. 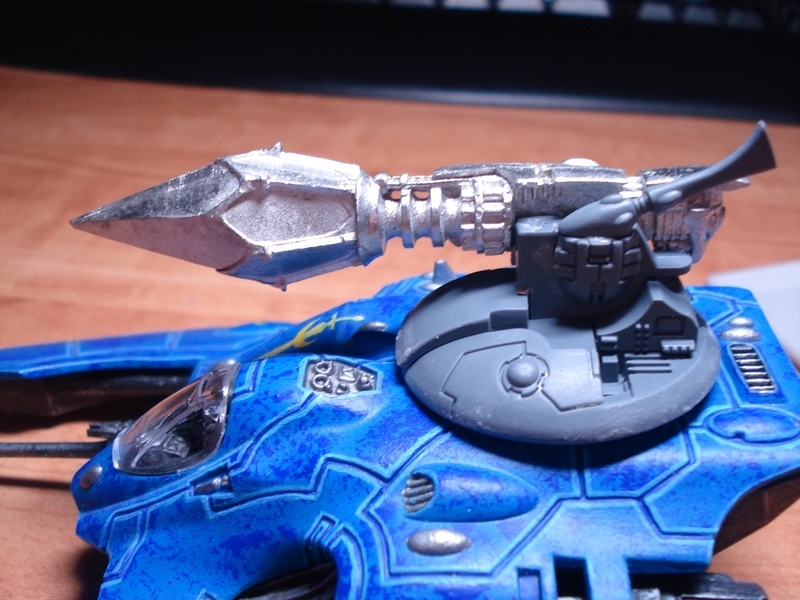 Seeing as I had a bunch of extra Tau stuff from the Skyray boxes that I was only using for Hammerhead parts and I don’t really care for the standard Fire Prism turret, I went and created some new turrets. 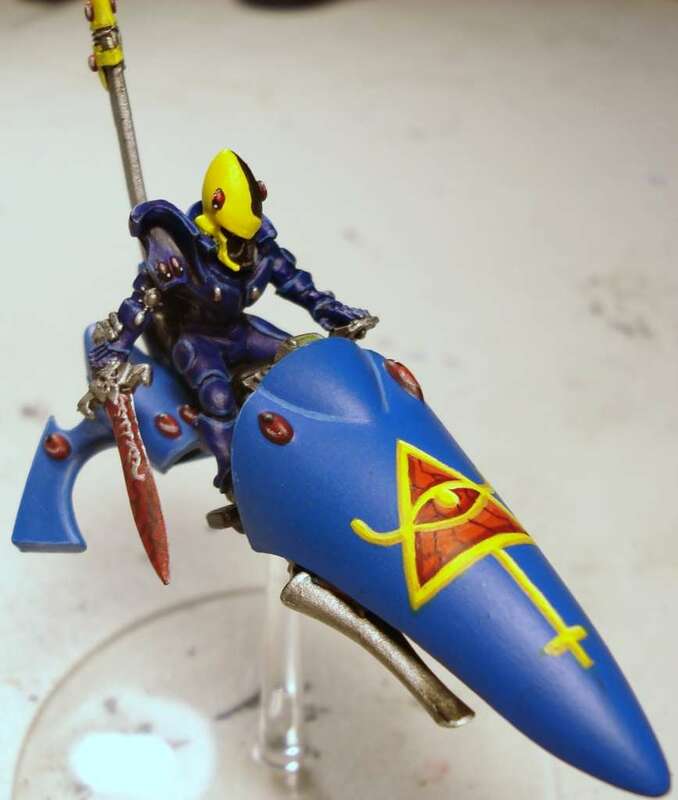 They use a trimmed down version of the Skyray turret mount to which I attached the main portion of the Fire Prism cannon. 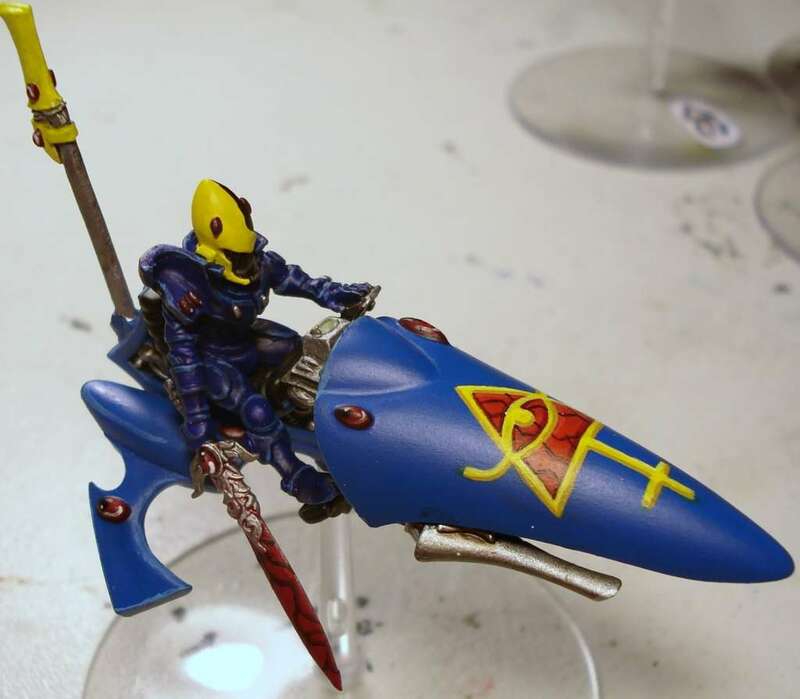 On the opposite side, I used a Necron scarab for a bit of detail and then added an Eldar fin on top for that bit of Eldar flare. 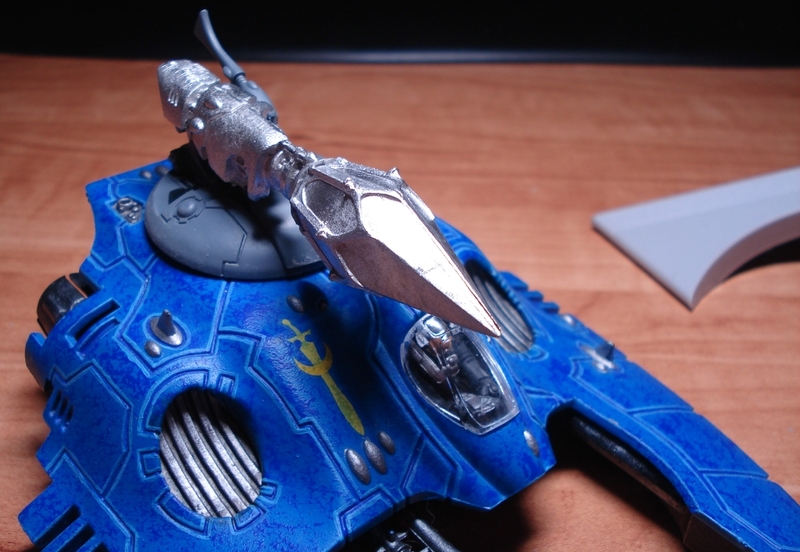 They’re quite simplistic, and much more akin to the Wave Serpents with the automated turrets. Plus they’re a lot less unwieldy. 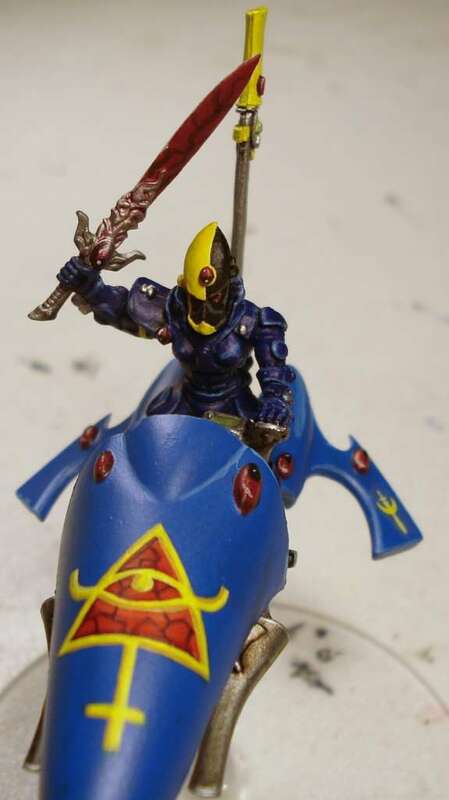 It has been a while, but I know I promised some pictures of my Storm Guardians. 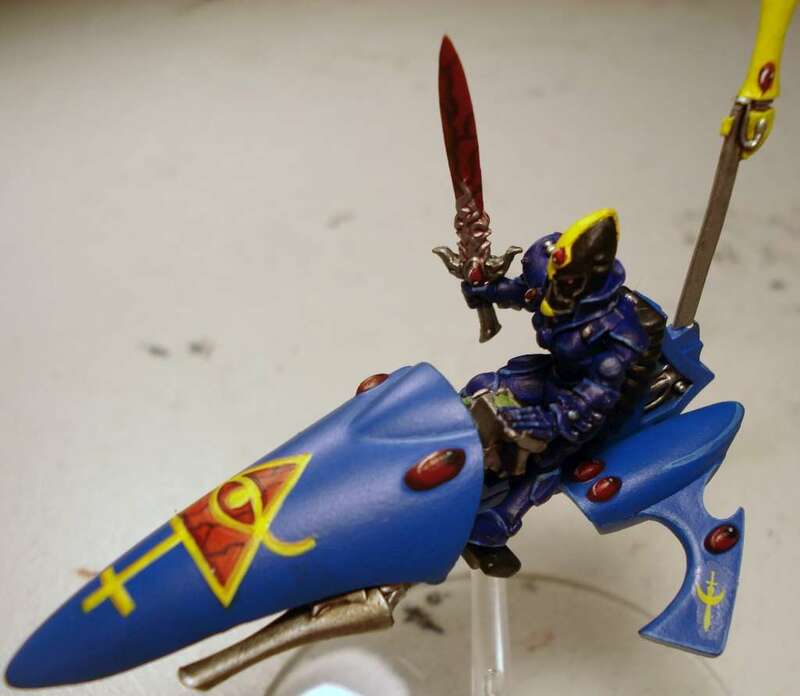 The pistols were a mix of Dire Avenger shuriken pistols and in a few cases a cut down shuriken catapult. The swords were taken from Dark Elf warriors. All in all, I think they turned out quite well. 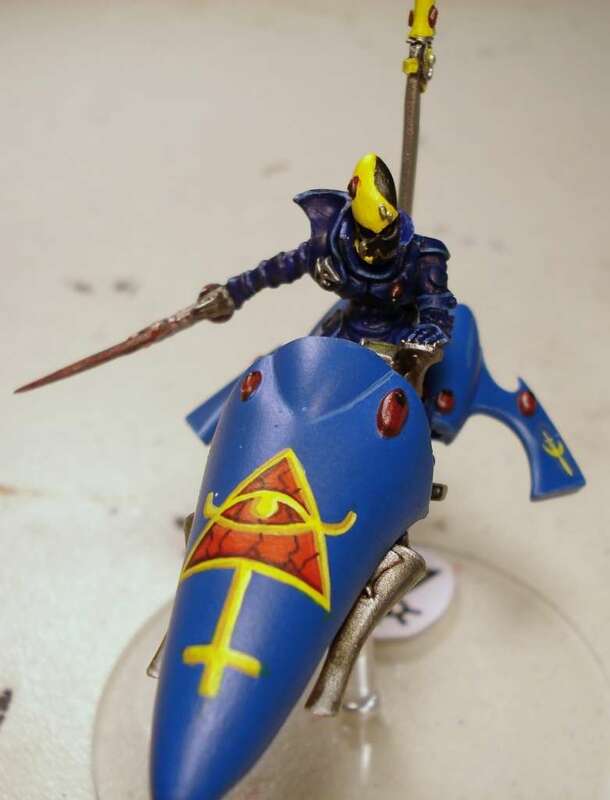 The Warlock portion of my Seer Council is now complete. Here they are in all their glory. 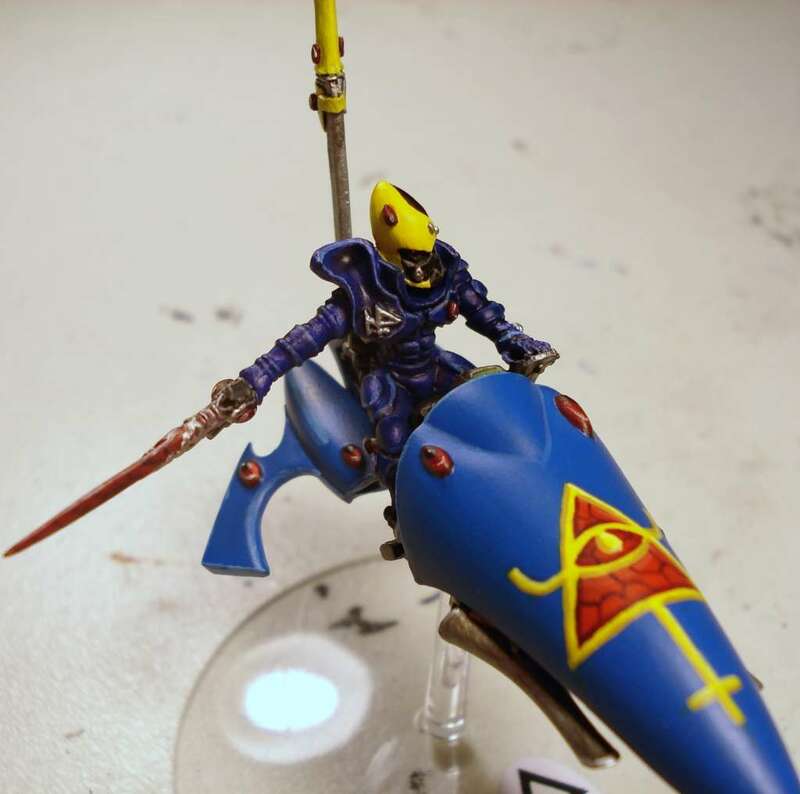 WIP: Warlock Highlights and shading. I was hoping to finish these tonight, but the highlights took longer than expected. 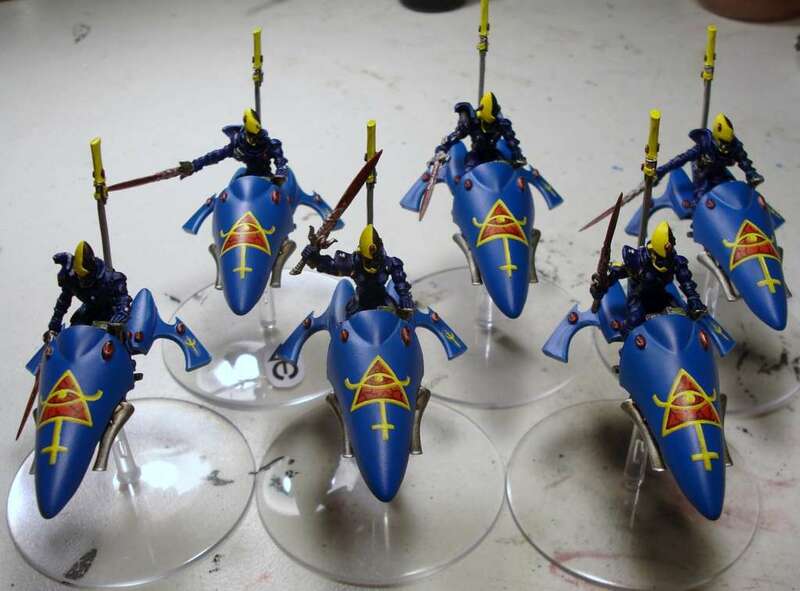 They just need some detailing on the gems, swords and control panels to finish them up.